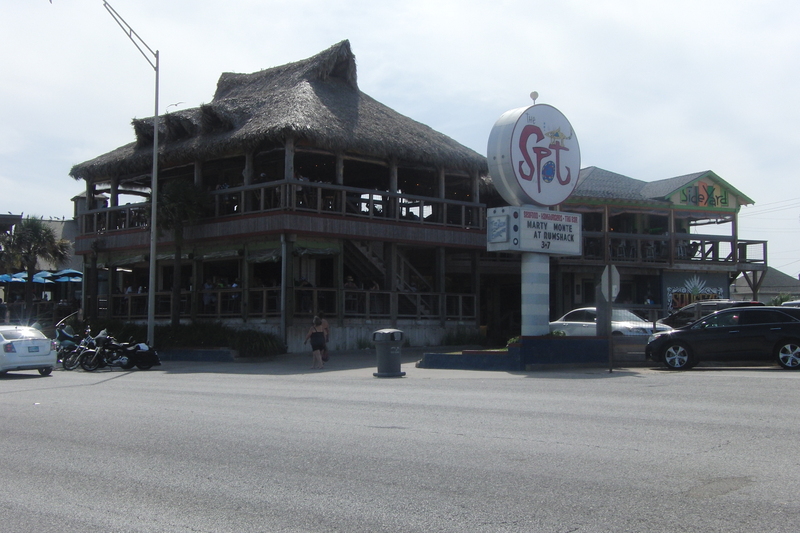 One of the funnest beach themed restaurants on Galveston Island is The Spot! 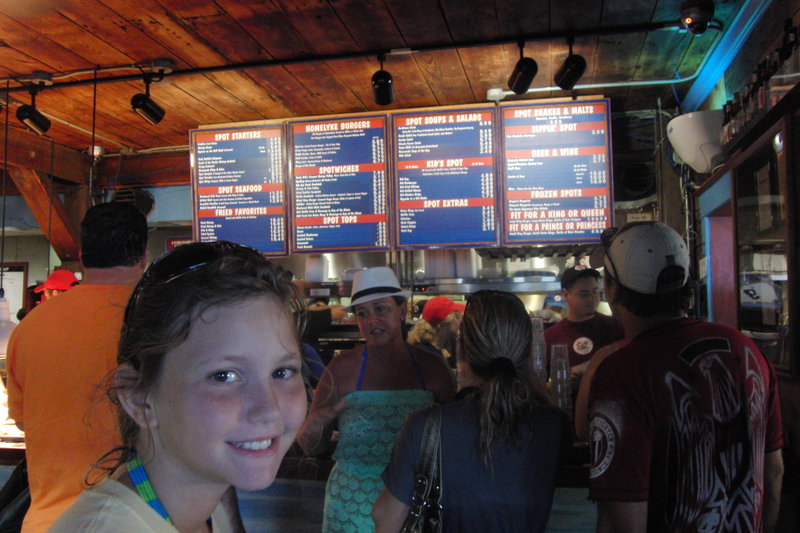 Built with a thatched roof and lots of open air seating, (and inside seating with air conditioning), our family has been a fan of the The Spot for years. We’ve also watched as they have built and built onto it, adding the Tiki Bar, Squeeze Rita’s and Tequilas, SideYard and Rum Shack, and now calling the entire place, Island Famous! But even with all the neighboring bars, The Spot is still as fun and family friendly as always! 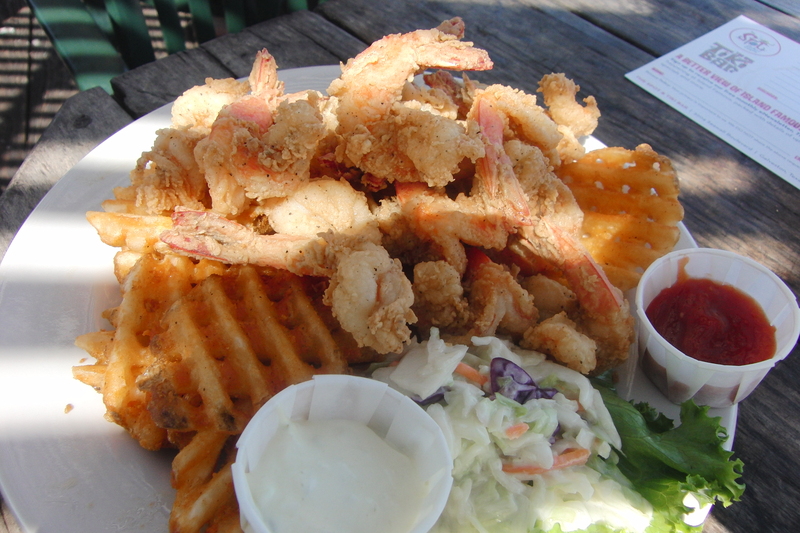 The menu offers lots for everyone, from burgers to seafood, and plenty of fun appetizers, too! With dining choices upstairs and down, inside and out, we choose to sit upstairs and outside, with a great view of the seawall and all the cars driving by, and the beach! As with all the “touristy” places, prices at The Spot are a little high, but my daughter and I split this amazing plate of fried shrimp with 16 shrimp, plenty for both of us! Well, we did leave a little room for dessert! The Sweet Spot offers ice cream and yummy cakes. We had the Chocolate Eruption and a cream puff! They were both delicious! After dessert, we needed to burn some calories, so we decided to walk down the Seawall. The Seawall was built in the early 1900’s following The Great Storm which killed over 6,000 people. Landfill was brought in from the dredging of the Houston Ship Channel, and elevated the entire city 12-15 feet above the beach. Today, the Seawall offers protection to the city, and a terrific place to walk, ride bikes or even skate above the beach! 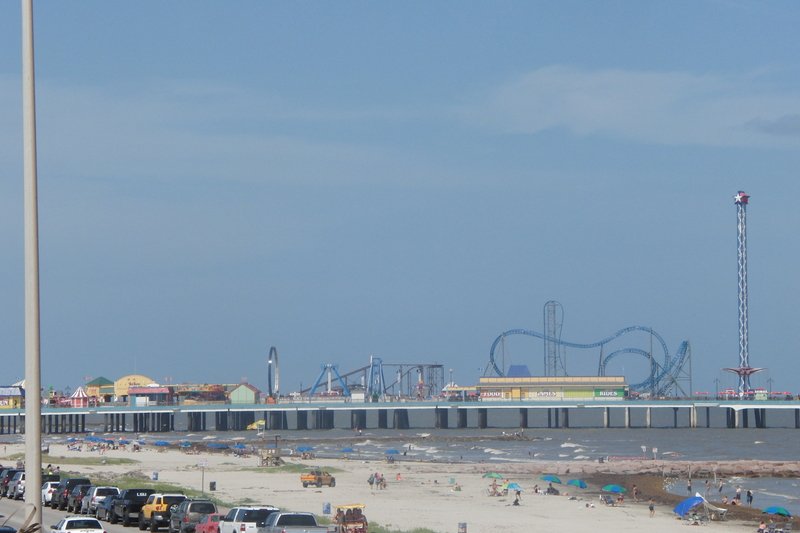 The Pleasure Pier is the newest addition to the Galveston Seawall. A boardwalk filled with arcade games and amusement park rides, it reaches out into the Gulf. It was built on the location of the old Flagship Hotel that was destroyed during Hurricane Ike. Tour buses line up on the Seawall for visitors to get a look at the island. 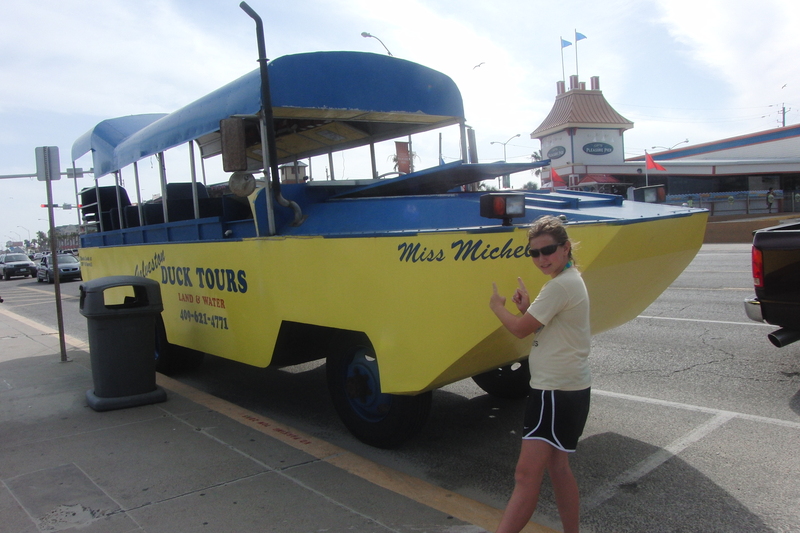 The Galveston Duck Tours are one of our favorites, with amphibeous vehicles that go into Galveston Bay! Click HERE to read about our tour! We walked about a mile down the Seawall. Although the temps were in the 90’s, the breeze off the gulf made it a nice stroll. We went down to the beach to play in the waves, and walked along squishing our toes in the sand. This visit was part of our “Girl-cation” my daughter and I took to Galveston Island. To read about our adventure from the beginning, please click HERE. To read the next (and last post) of our trip, please click HERE. Explore Galveston by car and boat on the Galveston Island Duck Tour, and never change your seat! Click HERE to read more! Camp on the beach or rent one of the cabins at Galveston Island State Park. Click HERE for more information.